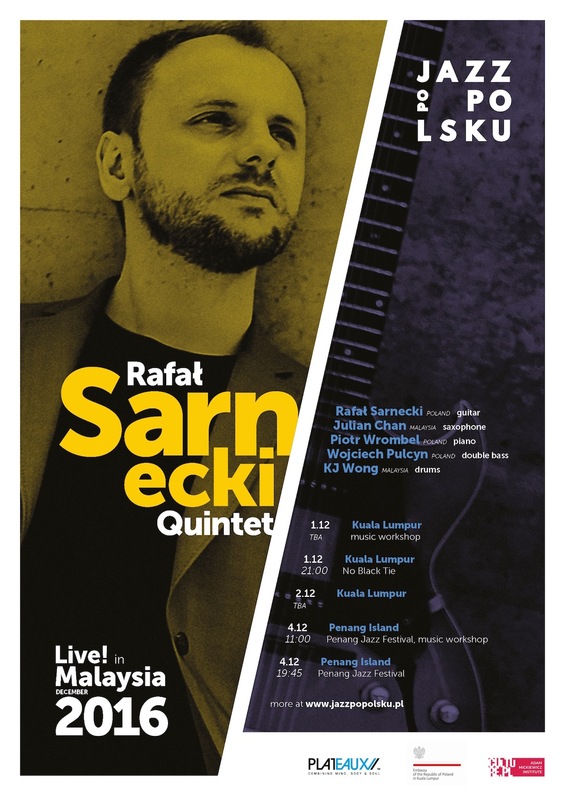 Rafał Sarnecki, one of the most sought after jazz composers of his generation, will give a concert tour in Malaysia. The Polish/Malaysian quintet will perform at Penang Jazz Festival and in Kuala Lumpur. Performances are held as part of the Jazz Po Polsku project, promoting Polish jazz in the international area. Originally from Warsaw, Poland, Rafał Sarnecki is a jazz guitarist and composer currently living in New York. In the 12 years that Rafał spent living in the Big Apple he has become one of the most sought after jazz composers of his generation. Sarnecki’s quintet will perform at one of the bigest jazz festivals in Malaysia – the 12th Penang Jazz Festival. The concert will take place on 4th December at 7:55 p.m. in Bayview Beach Resort in Batu Ferringhi, Penang. Sarnecki will also lead a guitar workshop at 11 a.m. (BBR Crystal Ballroom). The Rafał Sarnecki Quintet is a Polish/Malaysian collaboration with Julian Chan – saxophone, Piotr Wrombel – piano, Wojciech Pulcyn – double bass i KJ Wong – drums. The group will also perform on 1st December in the prestigious No Black Tie jazz club in Kuala Lumpur. Concerts are held as part of the Jazz Po Polsku project, and are carried out in cooperation with the Embassy of Poland in Kuala Lumpur, Plateaux Foundation and Culture.pl. As a leader of his own projects, Sarnecki has toured 11 European countries, China, South Korea, Israel and the East and West Coast of the US. He has shared the stage with many top names from the US jazz scene, such as Joel Frahm, Ingrid Jensen, Willie Jones III, Gary Thomas to list a few. He has recorded 3 CDs as a leader. The debut album Song From a New Place (2008) was nominated for the Fryderyk 2009 Award, the Polish equivalent of a Grammy. Rafal’s second album, The Madman Rambles Again, was released in 2011 by the Fresh Sound New Talent label. Dave Sumner from All About Jazz selected the album as one of the 12 most interesting jazz releases of 2011 in the Editor’s Choice section. Additionally, Hi – Fi magazine selected The Madman Rambles Again as one of the best jazz albums of 2011. In August 2014, Rafal’s third CD Cat’s Dream was released by the Brooklyn Jazz Underground Records. Jazz Po Polsku is a music label, presenting a wide spectrum of young Polish musicians from the jazz/avantgarde scene. It also helps in establishing cultural cooperation and integrates artists from many countries. The project aims at refreshing the image of the Polish jazz music on the international arena. Jazz Po Polsku has been presenting Polish artists in Asia 60 times so far in concerts & music workshops. The label has been founded in 2010 and coordinated by Jakub Krzeszowski, music promoter and culture marketing manager. 4.12 Penang, Penang Jazz Festival, BBR Crystal Ballroom, music workshop | 11:00 A.M.
4.12 Penang, Penang Jazz Festival, Bayview Beach | 7:55 P.M.